I hope everyone had a great Christmas and a Happy New Years. I know it’s been a productive one for me. Over the winter break, I added a new feature to the NaviSet Transfer plugin. 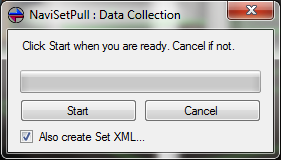 You run the plugin just as you did before, but this time you click the checkbox “Also create Set XML”, and it will produce an XML file that you can import into Navisworks later, just as you would a search set XML file. A possible downside is that especially large imported sets could take a while to select because when they’re brought in, they’re treated like search sets (by searching for each individual object by ID number). But this can be mitigated by saving them as selection sets again after they’re selected. The update is available now for new users and also in the link provided to you by Paypal when you purchased the plugin. If you’ve lost it and I haven’t emailed you about the release yet, feel free to contact me by leaving a comment below. This entry was posted in Plugin Development on January 4, 2016 by Chris.